David Nevue, author of "How to Promote Your Music Successfully on the Internet," is making a rare appearance on September 25th, 2009 at "The Sound Kitchen" in Franklin TN to discuss ways independent artists can use the Internet to successfully promote their music and generate CD and digital music sales online. 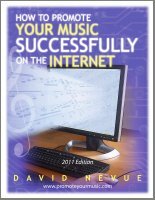 Unlike many other "music marketing" authors and consultants, David does more than just talk theory. He is himself a successful musician who built his music career entirely on the Internet. He started promoting his music online in 1995, and was able to quit his "day job" to do music full time in 2001. He has been a "full time musician" ever since. In the FREE two hour workshop, David will talk about his approach to music marketing and Internet promotion and take questions and answers from attendees. WHERE: The Sound Kitchen, 112 Seaboard Lane, Franklin, TN 37067. COST: It's FREE. Seriously. David will have some of his books on hand if you would like to purchase one. That's it. No pressure. No sales pitch. Just the information. The workshop is being sponsored by Middle Tennessee State University. Register here. 10:00 am-Noon: Recording the Piano. Learn how to make high quality recordings of the piano. Talk given by Joseph Akins and Michael Fleming, professors of the Dept. of Recording Industry at MTSU. 3:30 pm-5:30 pm: Piano Workshop with David Lanz. Lanz will cover many aspects of performance, composing, practice, and the application of music in the real world. David Lanz is a two-time Grammy nominee, whose "Heartsounds" album helped launch the famed Narada records in the early 80's. 8:00 pm - 10:30 pm: Whisperings: Solo Piano Concert - For the past five years, Whisperings solo piano concerts have been growing in popularity across the country. Ignited by the internet radio station with the same name, a Whisperings concert showcases artists (pianist and composers) heard on the broadcast. This show will feature the legendary David Lanz with guests David Nevue, Joseph Akins and Philip Wesley. This will be an intimate event that allows you to get close to the artists as they perform their compositions and tell the stories behind them. Tickets are $25 for adults and $15 for students and can be purchased in advance from http://www.solopianoradio.com/events.htm. I just received my biggest single payout ever for digital music sales from CD Baby. How much? Over $2,000 just in digital music sales. That completely blows my mind. Seeing that I make "about" .60-some-odd cents per track sold on average, that means this single payment represents about 3,200 downloads sold. It's amazing to know there are that many people buying my music. Lest you think my success is the result of some gimmick, think again. I'm just a pianist. Nothing extravagant. I just play, write, and record my music. I have a few cover tunes, yes, but surprisingly that's not where most of my sales come from. A hefty portion of my digital music sales comes from my original music. In fact, my best selling song is an original tune called "No More Tears." If you look at my top ten best selling singles, six of the ten are original tunes I wrote. I have been enjoying great digital music sales for awhile now. I typically average between $1,500-$2,000 over a month period. But to get one single payment of that size (CD Baby pays out weekly) is a marvelous thing. My lovely wife, the love of my life, is rejoicing. "I received my largest deposit ever from CDBaby. Record month for digital music sales! I'd do a happy dance if I wasn't so full from dinner!" "Hi david...to what do u owe your great digital sales success?" That got me to thinking about it. Why do people buy music? What is it that makes someone, a total stranger, actually go out and PURCHASE your music? Especially when, in this day and age, people can find so much music for free on the Internet? To what do I owe my great digital sales success? Now, I could get spiritually-minded here. I could say, To whom do I owe my great digital sales success and then thank God for His great provision. That would certainly be correct and true. However, it would be a bit prideful and silly to say that God is out there telling people to buy my music. Yes, there certainly is a spiritual element to what I do. My music is faith-based. But there's more to it than that. 1) I write music that some folks love so much that they can't wait to share it with others. 2) I have a large catalog. I have a discography of ten albums now containing somewhere in the neighborhood of 140 tunes. More product = more sales. It's easier to sell a little of a lot than it is to sell a lot of a little. When someone discovers a song of yours that they love, they'll listen to your other songs as well. And that single sale might turn into a whole lot more sales. The more product you have, the more you have the potential to sell. But when all is said and done, it comes down to the music. You can be the best online marketer out there, have a fantastic web site, get widespread distribution and all the press in the world and still not sell very much music. True? Yes, absolutely. A great web site and publicity will help you sell great music. But it won't help you sell mediocre music, or even skillfully played music that people don't connect with. You can watch someone play and be amazed at their skill on their instrument, but is that what makes you buy their music? No. You don't buy the music because someone is a great player, you buy the music because you like it. And even if you get caught up in the moment and buy someone's CD because you were amazed at their skill, what happened when you got home and actually listened to the CD? The excitement faded, didn't it? Because what you want to listen to for enjoyment is music that speaks to you emotionally, not technically. Music is all about emotion. For total strangers to buy your music online, especially if they are hearing it or sampling it for the first time, they have to fall in love with it in that very moment. Call it "love at first listen." They have to want it, to desire it, and then for you to find real success, your buyer has to love it so much that after experiencing it they can't help but to share it with their friends, family and co-workers who, in turn, fall in love with your music. That's how real success happens. That's how you grow a business based on your music. At its core, music is more than just dials and buttons. It's more than good production. It's more than a great mix, more than a marketing plan, more than a skillfully played instrument. It's raw, untamed, emotion. Capture that, and you just might have something. 1) Focus on your music and songwriting, first. 2) Then focus on the recording and production, taking great songs and making them sound the best they can possibly be. 3) Then focus on the marketing, distribution, and promotion. A final word of advice: Never, ever, ever release an album or song before it's time. Never be in a hurry to release your music. Make sure what you put out there is 100% what you want it to be and that it represents you well. Because once you put it out there, you can't take it back. Do it right, no matter what it takes. If you settle for doing less than your best, then less than your best is what others will perceive as your "best." And is what you are about to release really your best work? Make it your best. Do it right. And then enjoy life. Author of "How to Promote Your Music Successfully on the Internet"
I'm a big fan of house concerts... when I go out on tour, about half the concerts I perform are in people's homes. There's nothing quite like it. I LOVE playing them. You meet so many great people on a one-to-one basis. You talk, you share, you play... and these folks love your music. So going in, you have that in common. Makes it easy to small talk. You may scoff at the idea of playing a concert in a persons home because you are concerned about SIZE. The size of the audience doesn't matter. In fact, you will likely find, as I did, that playing a concert to a small audience in a home is much more effective and financially lucrative than playing in a "typical" venue. How much money do you usually command when you play a show in a club? $100 bucks? $200? I typically ask $500 for a house concert. I know musicians who charge as much as $1500 for an intimate home show. Now, I don't do that, because personally I want my concerts to be affordable to the average person. Most people won't and can't justify paying $1500 for a concert. But if someone is a real fan of your music, they'll find a way to come up with $500 for a show custom tailored just for them - and they'll be even more stoked about if it you offer to play their favorite songs for them in their own home. And what's even MORE fantastic about playing house concerts is how easy they are to do. All you have to do is show up and bring your instrument (if you are a pianist, as I am, you can play THEIR instrument. In that case, you just bring the clothes on your back and CDs to sell). Your concert host does all the promotion, bringing in their friends, family and coworkers to show off YOUR music - which is among their favorite music - to their personal network of friends. So you have no promotion costs to worry about. Oh, and guess what? The host provides the food too. And they will probably even invite you stay the night to save you that hotel bill. And how are CD sales? Ridiculous. At least, compared to playing a club. When you play a club, how many fans are there to see YOU? Or do you play and do your thing while people mill about talking, eating and drinking and hardly take notice you? Maybe you sell a CD here and there, but are you selling DOZENS of them? At a house concert, you have a totally attentive audience. You can engage them, telling stories about your songs, laughing together, crying together, sharing not only your music, but YOURSELF with them. And if you're engaging, and if your storytelling and your music touches them, you'll sell CDs like candy. When I play a house concert, I generally sell an average of 1 CD per person in the audience. There are those who don't buy, but those are made up for by those who buy multiple CDs. So with one house concert to say 30 people (about 15 couples), which is about my average, I'll sell 30-40 CDs. Let's say 35. At a $12 per CD average, that's $420. Plus my $500 fee. That's $920 for 3 hours of playing and hanging out with people who love my music. Oh, and they provide me a meal and a place to stay. What's that worth? Another $120 bucks? So when I play a house concert I come out ahead by $1,000 bucks a night. If you sell merchandise as well, you can do even better. Now that's great money, and if you're in it for the money, then, well, there you go. But I'm not in it just for the money. House concerts are also a great way to develop relationships with your fans. And if your life and music are faith-based and ministry-based, as mine is, then there is no better way to connect with people and share your faith and testimony. It's about meeting and touching REAL people with REAL lives. Encouraging people who love your music. Exhorting them. Lifting them up. Helping them to get back on their feet. Making a difference, one home at a time. But back to the money, because I know that's an important factor. We all have to support our families and our art. None of us want to lose money on a tour. I've played to house concert audiences as small as seven people. Guess what? I still made $500 bucks plus a few CD sales. On the other side of the spectrum, I've played house concerts to over a hundred people - and sold well over a hundred CDs at a show. Almost $2,000 for 3 hours of work? That buys a lot of groceries. My wife loves that. More OPPORTUNITY. Not only financially, but to build relationships that are lasting. I talk about setting up house concerts in my book, How to Promote Your Music Successfully on the Internet. If you haven't got that already, you might want to check that out. In today's connected world, with Twitter, Facebook and MySpace being all the rage, setting up a house concert tour is easier than ever before. Read the story of solo bassist Steve Lawson. You'll find his blog posting about his own house concert tour experience at http://www.stevelawson.net/wordpress/2009/02/real-life-touring-a-social-media-fuelled-tale/ . It's well worth reading. Also recommended: Concerts in Your Home. So the next time you're on tour and want to fill up those empty nights on your calendar, start talking with your fans in the area. Offer to play in their homes. You can ask your fee or even just ask for donations from the crowd. You might not make as much in donations, but playing a show in someone's home and making $200 from donations plus any CD sales you do is better than sitting at a hotel all by your lonesome eating pizza and watching American Idol. Play house concerts and you can BE an American Idol, one house at a time.